Not to be confused with Monroe, Texas. Conroe is a city in Texas, United States. It is the seat of Montgomery County and a principal city in the Houston–The Woodlands–Sugar Land metropolitan area. It is about 40 miles (64 km) north of Houston. Conroe welcome sign, located at the corner of SH 105 and Dallas St.
As of 2016, the population was 82,286, up from 56,207 in 2010. According to the Census Bureau, Conroe was the fastest-growing large city in the United States between July 1, 2015, and July 1, 2016. The city is named after Northern-born Union Cavalry officer and Houston lumberman Isaac Conroe. Conroe founded a sawmill there in 1881. The city originally gained in wealth due to the lumber and oil industries. Originally named "Conroe's Switch", the area saw an influx of residents in the late 19th century due to the lumber demands on the piney wood forest of the area. During the 1930s, because of oil profits, the city boasted more millionaires per capita than any other U.S. city, though only briefly. After the construction of Interstate 45, many Houstonians began to settle communities around Conroe. The Office of Management and Budget classifies Conroe as a principal city within the Houston–The Woodlands–Sugar Land metropolitan area. The city is about 40 miles (64 km) north of Houston. When Conroe incorporated in 1904, the city limits encompassed a 5.44 square mile area. From 1970 to 2000, the city limits expanded from 7.15 square miles to 42.35 square miles. Beginning in 2007, the city outlined a plan to continue expanding its city limits through annexation. According to Chapter 43 of the Texas Local Government Code, home rule municipalities like Conroe may annex territory that is adjacent to the city's current boundaries, with certain restrictions. The city's 2007 plan was to double its size through a combination of voluntary and involuntary annexations. In voluntary annexations, the city enters into an agreement with the property owner to annex the territory once it has been developed. Involuntary annexations occur when the city places adjacent unincorporated territory into a three-year annexation plan without obtaining the property owners' consent. As of 2018, the city has annexed territory every year since 2007, increasing the city limits from 52.8 to 72.0 square miles. April Sound, a gated community along the shores of Lake Conroe, was annexed by the city on January 1, 2015. Prior to annexation, the community's water and sewage services were provided by two separate Municipal Utility Districts. When annexation was first approved by the Conroe city council in December 2011, the districts opposed it. In response, the city negotiated an agreement in 2013 that would allow the districts to continue to provide services to April Sound residents. However, some April Sound residents did not support the annexation, including a group of residents who filed a lawsuit against the city in April 2015. The lawsuit was dismissed in March 2017. Involuntary annexations were a major issue in the 2016 mayoral election, the first after April Sound residents were incorporated into the city. Proponents of annexation contended that it was a useful tool to "promote and facilitate growth and progress," while those in opposition were concerned about whether annexed territories receive a "fair shake" in the negotiations. Toby Powell, who campaigned against "forced annexations," won the election. In 2017, the city council voted in favor of additional involuntary annexations over Powell's objection. Middle Lake on the southern side of Jones State Forest. Conroe is in the southwest corner of the East Texas Piney Woods. The Piney Woods consist of pine trees and hardwood forests. The most common type of tree in the southwest Piney Woods is the loblolly pine. Shortleaf pine are also abundant. Pockets of blackland prairie vegetation are also present, but are disappearing due to urbanization. In 1926, the Texas A&M Forest Service purchased 1700 acres of Piney Woods to establish W. Goodrich Jones State Forest. The forest serves as a research and demonstration area for sustainable forestry techniques. The forest also preserves the habitat of the red-cockaded woodpecker, a species classified as Near Threatened by the IUCN. In 2017, Texas A&M asked Conroe state senator Brandon Creighton to author a bill setting aside 10 percent of the forest for educational and research-related development. The bill also opened the possibility of commercial development on the land. Public concern over the bill persuaded Creighton to revise it. The final version, which passed the Senate unanimously, protected the entire forest from development. The West Fork of the San Jacinto River as seen from McDade Park on the western edge of Conroe. The West Fork of the San Jacinto River flows through the western edge of Conroe. The entire city is within the river's watershed. The river flows southeast from Lake Conroe, a 19,640 surface acre lake dammed in 1973 as an alternative source of drinking water for Houston. Conroe sits on several geologic layers of underground aquifers, which supply the city with fresh drinking water. Due to the rapid development of the land and increased population of Conroe and the surrounding area, the groundwater supply is being withdrawn faster than it can be replenished. As a result, the Lone Star Groundwater Conservation District, which oversees groundwater usage in Montgomery County, mandated that Conroe reduce its groundwater usage by 30 percent of 2009 amounts by January 1, 2016. As part of the groundwater usage reduction plan, the San Jacinto River Authority began in September 2015 to supplement Conroe's groundwater supply with surface water pumped from Lake Conroe. The SJRA charges the city usage fees to cover the cost of pumping and treating the water. On August 27, 2015, the City of Conroe filed a lawsuit against the Lone Star Groundwater Conservation District, claiming that the LSGCD did not have the authority to limit the city's groundwater usage. The city also refused to pay SJRA water usage fee increases in 2016, resulting in a separate lawsuit filed by the SJRA against the city. As of 2017, both lawsuits are still ongoing, resulting in legal fees charged to the city of over $836,313. Parts of Conroe surrounding the West Fork of the San Jacinto River are in a floodplain. Significant flooding occurs along the floodplain when rainfall exceeds nine inches in a 48-hour period. The Conroe area has approximately a 10 percent chance of receiving this much rainfall in any given year. Urban development in Conroe and the surrounding area has also exacerbated the risk of flooding. Montgomery County experienced three consecutive years of 500-year floods in May 2015, April 2016, and August 2017. A 500-year flood has a 0.2 percent chance of occurring in a year. In addition, a fourth major flood occurred in May 2016, resulting in two major floods in two months. The flooding in August 2017 during Hurricane Harvey dropped nearly 32 inches of rain on the city. To protect the integrity of the dam, San Jacinto River Authority officials released 79,100 cubic feet per second of water from Lake Conroe downstream into the West Fork of the San Jacinto River, exacerbating the flooding already taking place along the floodplain. Conroe city officials ordered a mandatory evacuation of McDade Estates, a neighborhood on the banks of the river. As a response to the flooding, Montgomery County commissioners in October 2017 requested $1.25 million from the federal government for a flood mitigation study, along with an additional $95.5 million to implement various flood mitigation projects. During the first decade of the 21st century, the city attracted many new residents from the Houston area. Renée C. Lee said that Conroe around 2002 was "a sleepy, backwater town" and that at the time, Conroe city officials needed to use financial incentives to attract home developers to Conroe. Between 2003 and 2006, Conroe became a hotbed of construction of new houses. As a result, Conroe's population grew from 36,811 in 2000 to 56,207 in 2010. As of the census of 2010, there were 56,207 people, 18,651 households, and 13,086 families residing in the city. Since the 2010 census, Conroe's population has continued to grow. Between 2014 and 2015, Conroe was the sixth fastest growing city in the United States. The following year, the US Census Bureau reported that Conroe was the fastest-growing large city in the United States. It had a 7.8% growth rate between 2015 and 2016. New housing developments throughout the city have contributed to the rapid population growth. Conroe's annexation of growing communities within its extraterritorial jurisdiction has also contributed to its growth. The demographics of the city's downtown area south of SH 105[a] differs from the rest of the city. In 2010, the population density of the entire city was 1066.2 people per square mile (411.7/km²). By contrast, the population density downtown was between 3,475.2 and 4,119.3 people per square mile. The racial makeup of the city was 69.7% White (including Hispanic), 10.3% African American, 1.2% Native American, 1.8% Asian, less than 0.05% Pacific Islander, 13.7% from other races, and 3.2% from two or more races. Hispanic or Latino of any race were 38.5% of the population. White alone (not Hispanic or Latino) were 48.3% of the total population. In the southern portion of downtown, White alone made up between 20.4 and 22.4 percent, African American were between 19.0 and 20.3 percent, and Hispanic or Latino were between 56.6 and 57.7 percent of the population. According to the 2016 American Community Survey, the median income for a household in the city was $50,517 and the median income for a family was $60,087. Males had a median income of $44,343 versus $37,747 for females. The per capita income for the city was $28,672. About 12.2% of families and 16.1% of the population were below the poverty line, including 19.4% of those under age 18 and 7.6% of those age 65 or over. According to the census bureau data aggregation website Statistical Atlas, the median income for a household in the southern portion of downtown was between $22,476 and $30,966. In response to income inequality, several non-profit groups including the Montgomery County United Way, The Salvation Army, and the Crisis Assistance Center help provide residents of the area with a variety of services ranging from transportation to food and shelter. In the early 1980s, Exxon considered consolidating its employees to a site in Conroe. The company ended the plans after the local oil-based economy collapsed. Crighton Theatre, first opened as a movie theatre in 1935, now hosts live theatrical performances. Downtown Conroe's Central Business District hosts multiple arts venues. The oldest is the Crighton Theatre, which opened on November 26, 1935. The theatre is named after Harry M. Crighton, Conroe's mayor from 1932 to 1933. The theatre functioned as the community's movie theatre until 1967, at which point it fell into disrepair. In 1979 it was renovated, and it now hosts live theatrical productions. Another theatre, the Owen Theatre, is also located in the district. The Central Business District has outdoor performance venues at Conroe Founder's Plaza and Heritage Place, which host multiple festivals throughout the year. The Conroe Cajun Catfish Festival, an annual event first held in 1990, features live music performances, arts and crafts vendors, and a carnival in addition to catfish and other Cajun food. In 2017, the festival prepared for a three-day attendance of 25,000-30,000 people. Bench art in downtown Conroe entitled, "A Tribute to George Strake" by local artist Joe Kolb, 2009. The city supports several arts organizations, including the Greater Conroe Arts Alliance. The Alliance is a network of multiple arts groups in the city such as the Conroe Symphony, the Conroe Art League, and the Montgomery County Choral Society. The Alliance also sponsors, along with the state of Texas, the Young Texas Artists Music Competition. The competition, founded in 1983, showcases young musicians who aspire to careers in classical music. In 2009, the city sponsored the Art Bench Project, which converted 13 stone benches scattered throughout the central business district into works of art. Each bench portrays a different part of Conroe's history and culture, from historical figures like George Strake and Charles B. Stewart to contemporary art groups such as the Crighton Players. The city contains multiple parks that pay tribute to the area's history. The Heritage Museum of Montgomery County, in Candy Cane Park, maintains artifacts of Montgomery County's early settlers. The Lone Star Monument and Historical Flag Park, next to the Montgomery County central library, pay tribute to the flags that flew over Texas. The flags are positioned in a circle around the park, with a statue of a Texian in the center. Each flag comes with a plaque that describes its connection to Texas history. At the park's entrance is a statue of Charles B. Stewart, who is claimed to have designed the lone star flag. Montgomery County War Memorial Park, in downtown Conroe next to the Montgomery County tax office, is a memorial to the 166 soldiers from Montgomery County who have been killed in active duty. The park's dedication ceremony was in 1976 and featured a speech by then president Gerald Ford. In 2017, the Montgomery County Commissioners Court and the City of Conroe agreed to relocate the memorial next to the Lone Star Monument and Flag Park. The park will also be expanded to include the names of up to 50,000 soldiers who have lived in Montgomery County. Construction on the new memorial was projected to begin in early 2018. Lake Conroe, northwest of downtown Conroe, is the source of several water-based activities such as boating and fishing. The most common fish in the lake are Largemouth bass, bluegill, channel catfish, white bass, and hybrid striped bass. Crappie may also be found in the early spring and fall. The Montgomery County Courthouse in downtown Conroe. According to the city's most recent Comprehensive Annual Financial Report Fund Financial Statements, the city's various funds had $58.3 million in Revenues, $71.6 million in expenditures, $69.6 million in total assets, $7.6 million in total liabilities, and $57.5 million in investments. City Manager Paul Virgadamo, Jr. The city employs 142 police officers. The county operates the main branch of the Montgomery County Memorial Library System. 98% of Conroe is represented in the Texas Senate (District 4) by Republican Brandon Creighton. A small portion of the northern part of Conroe is part of District 3, represented by Republican Robert Nichols. In the Texas House of Representatives, 94% of Conroe is part of District 16, represented by Republican Will Metcalf. The southern portion of Conroe is in District 15, represented by Republican Mark Keough. Less than 1% of Conroe residents are part of District 3, represented by Republican Cecil Bell, Jr. The Texas Department of Criminal Justice (TDCJ) operates the Conroe District Parole Office in Conroe. At the Federal level, the two U.S. Senators from Texas are Republicans John Cornyn and Ted Cruz; Conroe is part of Texas' US Congressional 8th District, which is currently represented by Republican Kevin Brady. The United States Postal Service Conroe Post Office is located at 809 West Dallas Street. Conroe High School, Conroe Independent School District. The city is served by the Lone Star College System primarily by the Lone Star College-Montgomery Campus and LSC University Center. Other campuses in the county include the EMCID Center in New Caney, and the Conroe Center. The territory in Conroe ISD joined the community college district in 1991, and the territory in Willis ISD joined the district in 1996. Almost all areas of Conroe are within the Conroe Independent School District though a small northern section of Conroe is within the Willis Independent School District. All of the schools listed here are in the city of Conroe. All of the Conroe ISD section of Conroe is zoned to Conroe High School. The Willis ISD section is zoned to Turner Elementary School, Brabham Middle School, and Willis High School, all of which are in unincorporated Montgomery County. The Courier is a daily newspaper published in Conroe, Texas, covering Montgomery County. In 2016, the newspaper was purchased by Hearst Communications, a media conglomerate which also owns and operates the Houston Chronicle. View of Texas State Highway 105 in downtown Conroe. The archway connects the Montgomery County Courthouse (right) with the Montgomery County Court Annex. In 2012 the U.S. Census Bureau designated the area around Conroe and The Woodlands as a "large urbanized transit area," an area defined as having over 200,000 residents, making it eligible to receive federal transportation funds. Interstate 45 directly connects the city with Houston to its south (40 miles) and with Dallas to its northwest (200 miles). Texas Highway 105 connects the city of Cleveland to the east and town of Montgomery to the west. Texas Loop 336 circles the city of Conroe. Conroe-North Houston Regional Airport provides general aviation services to Conroe. Greyhound Bus Lines operate a small station. Burlington Northern Santa Fe Railway BNSF Railway operates the busy Conroe subdivision, which is an east-west railroad main line that runs from Silsbee in Hardin County to Navasota in Grimes County where it intersects a main line running between Fort Worth and Galveston. Union Pacific Railroad Corporation operates another busy main line that runs north from Houston in Harris County to Palestine in Anderson County, known as the Palestine subdivision. The two railroads intersect at a diamond in downtown Conroe between Main and First Streets. The climate in this area is characterized by hot, humid summers and generally mild to cool winters. According to the Köppen Climate Classification system, Conroe has a humid subtropical climate, abbreviated "Cfa" on climate maps. ^ Official records for the entire Houston area were kept at the Weather Bureau in downtown Houston from July 1888 to May 1969, and at George Bush Intercontinental Airport since June 1969. ^ a b "The 15 Fastest-Growing Large Cities between July 1, 2015, and July 1, 2016 (Populations of 50,000 or more in 2015)" Vintage 2016 population estimates: United States Census Bureau. Accessed on June 15, 2017. ^ "2010 ANSI Codes for Places". United States Census Bureau. Retrieved 2018-03-13. ^ a b c d e f Jackson, Charles Christopher. Conroe, TX. The Handbook of Texas Online: December 11, 2015. Retrieved March 11, 2018. ^ OMB Bulletin 15-01, Revised Delineations of Metropolitan Statistical Areas, Micropolitan Statistical Areas, and Combined Statistical Areas, and Guidance on Uses of the Delineations of These Areas. Office of Management and Budget: July 15, 2015. Page 35. Retrieved March 11, 2018. ^ "Pilot Lands Small Plane On Conroe Street." Associated Press at KBTX. January 4, 2012. Retrieved on January 5, 2012. ^ 100 Plus Years of Growth: Conroe's City Limit Expansion 1904 to December 2013. City of Conroe, Texas. Retrieved March 12, 2018. ^ a b Kuhles, Beth. Conroe studies future annexation options. Houston Chronicle: February 22, 2007. Retrieved March 12, 2018. ^ Local Government Code Sec. 43.003: Authority of Home-Rule Municipality to Annex Area and Take Other Actions Regarding Boundaries. Texas State Legislature: Acts 1987, amended Acts 2017. Retrieved March 12. 2018. ^ a b c Mendoza, Jesse. Conroe expands city limits, tax base through annual annexation program. Community Impact Newspaper: June 8, 2016. Retrieved March 12, 2018. ^ a b c d City Limits through January, 2018. City of Conroe, Texas. Retrieved March 12, 2018. ^ Roden, Howard. Conroe, April Sound OK annexation. The Courier of Montgomery County: February 22, 2013. ^ Dominguez, Catherine. Judge dismisses annexation suit against Conroe. The Courier of Montgomery County: March 10, 2017. Retrieved March 13, 2018. ^ Green, Stephen. Annexation remains hot topic in mayoral race. The Courier of Montgomery County: June 18, 2016. Retrieved March 13, 2018. ^ Snyder, Mike. Conroe council OKs controversial annexations. Houston Chronicle: December 15, 2017. Retrieved March 13, 2018. ^ Pineywoods Wildlife District. Texas Parks and Wildlife. Retrieved March 10, 2018. ^ Pineywoods Wildlife Management. Texas Parks and Wildlife. Retrieved March 10, 2018. ^ a b c Flood Insurance Study: Montgomery County, Texas and incorporated areas volume 1 of 6. Federal Emergency Management Agency: September 23, 2008. Pages 6-8, 13. Retrieved March 11, 2018. ^ W. Goodrich Jones State Forest. Texas A&M Forest Service. Retrieved March 11, 2018. ^ "The IUCN Red List of Threatened Species". IUCN Red List of Threatened Species. Retrieved 2018-10-26. ^ Fletcher, Abner. The Present and Future of the W.G. Jones State Forest. Houston Public Media: April 11, 2017. Retrieved March 11, 2018. ^ West Fork San Jacinto Watershed Greenprint. The Trust for Public Land: July 2016. Retrieved March 10, 2018. ^ a b History of Lake Conroe. San Jacinto River Authority. Retrieved March 10, 2018. ^ Ground-Water resources of Montgomery County, Texas. Texas Water Development Board: November 1971. Pages 9-15. Retrieved March 11, 2018. ^ Oden, Timothy D. Groundwater Environmental Tracer Data Collected from the Chicot, Evangeline, and Jasper Aquifers in Montgomery County and Adjacent Counties, Texas, 2008. United States Geological Survey: 2011. Pages 1-7. Retrieved March 11, 2018. ^ a b Jordan, Jay R. Conroe loses rehearing motion on water lawsuit, could appeal to Texas Supreme Court. Houston Chronicle: March 7, 2017. Retrieved March 11, 2018. ^ a b c Mendoza, Jesse. Water dispute costs county residents millions of dollars. Community Impact Newspaper: July 25, 2017. Retrieved March 11, 2018. ^ Montgomery County Floodplain Viewer. Montgomery County, Texas, Geographic Information Systems (GIS). Retrieved March 11, 2018. ^ a b Zedaker, Hannah. Montgomery County recovers from historic flood conditions. Community Impact Newspaper: June 13, 2016. Retrieved March 11, 2018. ^ a b c Schlafer, Kelly. Local officials to study flood mitigation in Montgomery County. Community Impact Newspaper: January 24, 2018. Retrieved March 11, 2018. ^ a b Marshall, John S. Flooded-out Conroe-area residents returning to damaged homes. The Courier of Montgomery County: August 31, 2017. Retrieved March 11, 2018. ^ Osborne, Ryan. 40 miles from downtown Houston, ‘We thought the rain was going to come but not flood’ Star-Telegram: August 30, 2017. Retrieved March 11, 2018. ^ Lee, Renée C. "Conroe housing market going through the roof." Houston Chronicle. April 29, 2007. Retrieved on January 15, 2010. ^ a b c American FactFinder United States Census Bureau. Retrieved March 13, 2018. ^ a b Rhor, Monica, and John D. Harden. Conroe booming as America's fastest growing city. Houston Chronicle: May 26, 2017. Retrieved March 13, 2018. ^ Mary Bowerman (May 25, 2017). "The Census Bureau shows the fastest-growing cities in the U.S. are ..." USA Today. Retrieved February 18, 2018. ^ Median Household income by tract in Conroe. Statistical Atlas. Retrieved March 14, 2018. ^ Mendoza, Jesse. Economic inequality challenges cities. Community Impact Newspaper: February 24, 2016. Retrieved March 14, 2018. ^ Dawson, Jennifer. "Exxon Mobil campus ‘clearly happening’." Houston Business Journal. Friday January 15, 2010. 2. Retrieved on January 16, 2010. ^ Hernandez, Sondra. Crighton Theatre 'Crown Jewel of Conroe' still shines after 80-plus years. Courier of Montgomery County: May 10, 2017. Retrieved March 15, 2018. ^ Mendoza, Jesse. Stage set for new performing arts venues in Conroe. Community Impact Newspaper: February 22, 2018. Retrieved March 15, 2018. ^ Mendoza, Jesse. Downtown initiatives aim to attract visitors. Community Impact Newspaper: July 15, 2015. Retrieved March 15, 2018. ^ Ellsworth, Meagan. 2017 Conroe Cajun Catfish Festival Overcomes Harvey. The Courier of Montgomery County: October 14, 2017. Retrieved March 15, 2018. ^ Greater Conroe Arts Alliance unveils two sculptures honoring the arts in Conroe. Conroe Today: July 16, 2013. Retrieved March 15. 2018. ^ Current Member Organizations. Greater Conroe Arts Alliance. ^ Young Texas Artists Music Competition's Bach, Beethoven & Barbecue set for March 10. Houston Chronicle: February 23, 2018. Retrieved March 15, 2018. ^ Kuhles, Beth. Conroe art bench project debuts downtown. Houston Chronicle: August 10, 2009. Retrieved March 15, 2018. 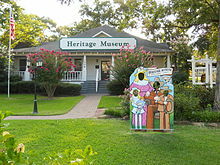 ^ "Heritage Museum of Montgomery Co". Heritage Museum of Montgomery County, Texas. Retrieved August 8, 2013. ^ Barrett, Natasha. Precious relics of Texas history stolen from Heritage Museum. Eyewitness News: July 19, 2017. Retrieved March 15, 2018. ^ Meyer, Brad. Lone Star Flag Park celebrates Texas History. Houston Chronicle: April 15, 2012. Retrieved March 15, 2018. ^ Spain, Charles A. Who Designed the Lone Star Flag? Heritage Volume 18, Number 1: Winter 2000. Retrieved March 15, 2018. ^ a b c Zedaker, Hannah. Veteran's memorial commission planning to relocate War Memorial Park. Community Impact Newspaper: June 12, 2017. Retrieved March 15, 2018. ^ Ford, Gerald R. Remarks at Dedication Ceremonies for the Montgomery County War Memorial Park in Conroe, Texas. The American Presidency Project: April 29, 1976. Retrieved March 15, 2018. ^ Dominguez, Catherine. Commissioners commit to help fund Montgomery County war memorial. San Antonio Express News: March 30, 2017. Retrieved March 15, 2018. ^ Lake Conroe. Texas Parks and Wildlife Department. Retrieved March 15, 2018. ^ "Administration." City of Conroe. 1 of 3 Archived 2010-07-06 at the Wayback Machine. October 24, 2009. Retrieved on January 16, 2010. ^ "Parole Division Region I Archived September 28, 2011, at the Wayback Machine." Texas Department of Criminal Justice. Retrieved on May 15, 2010. ^ "Post Office Location - CONROE." United States Postal Service. Retrieved on December 8, 2008. ^ "Lone Star College System Locations". Retrieved 2012-12-10. ^ "Conroe High School". Retrieved 2012-12-10. ^ "A.R. Turner Elementary School". Archived from the original on 2013-01-15. Retrieved 2012-12-10. ^ "Robert P. Brabham Middle School". Archived from the original on 2013-01-15. Retrieved 2012-12-10. ^ "Willis High School". Archived from the original on 2013-01-15. Retrieved 2012-12-10. ^ Dominguez, Catherine (2012-08-29). "New Catholic high school breaks ground". The Spring Observer at the Houston Chronicle. Retrieved 2017-03-25. ^ Lewis, Al. Hearst purchases community newspapers across Houston's suburbs. Houston Chronicle: July 29, 2016. Retrieved February 25, 2018. ^ Lee, Renée C. "Growth transforms rural areas north of Houston to urban centers." Houston Chronicle. Saturday October 6, 2012. Retrieved on October 7, 2012. ^ a b c City of Conroe: Transit. Accessed on June 25, 2017. ^ "Brandon Allen Stats". Baseball Almanac. Retrieved November 21, 2012. ^ "Brian Barkley Stats". Baseball Almanac. Retrieved November 21, 2012. ^ Mulvaney, Erin, and David Barron. Former Olympian cyclist dies in overnight crash. Houston Chronicle: October 15, 2012. Accessed on July 4, 2017. ^ Hayward, Anthony. Obituary: Richard Bradford, American television and film actor. The Scotsman: April 13, 2016. Accessed on July 5, 2017. ^ Jeromy Burnitz Stats Baseball Almanac. Accessed on July 4, 2017. ^ "28 Rock Cartwright, RB". CBSSports.com. Retrieved November 21, 2012. ^ "Andrew Cashner Stats". Baseball Almanac. Retrieved November 21, 2012. ^ Green, Stephen. Superbike world champion Colin Edwards named Conroe Legend. The Courier of Montgomery County: September 3, 2015. Accessed on July 4, 2017. ^ Walsh, Colleen (4 May 2017). "Annette Gordon-Reed's personal history, from East Texas to Monticello". Harvard Law Today. Harvard Law School. Retrieved 7 October 2018. ^ "Kevin Slowey Stats, Video Highlights, Photos, Bio". Retrieved 2012-12-10. ^ "Data Tools: 1981-2010 Normals for Conroe, Texas". National Centers for Environmental Information. Retrieved 2017-07-10. ^ "NOWData: Monthly Summarized Data for Conroe, Texas". National Oceanic & Atmospheric Administration. Retrieved 2017-07-10. Wikimedia Commons has media related to Conroe, Texas. Lone Star Monument and Historical Flag Park. City of Conroe Parks information.